Produced once again by the bands long term engineer Dennis Ward (Krokus, Angra, Allen & Lande, Pink Cream 69), “Trinity” picks up where “The Second Coming” left off, but with a certain added oomph! 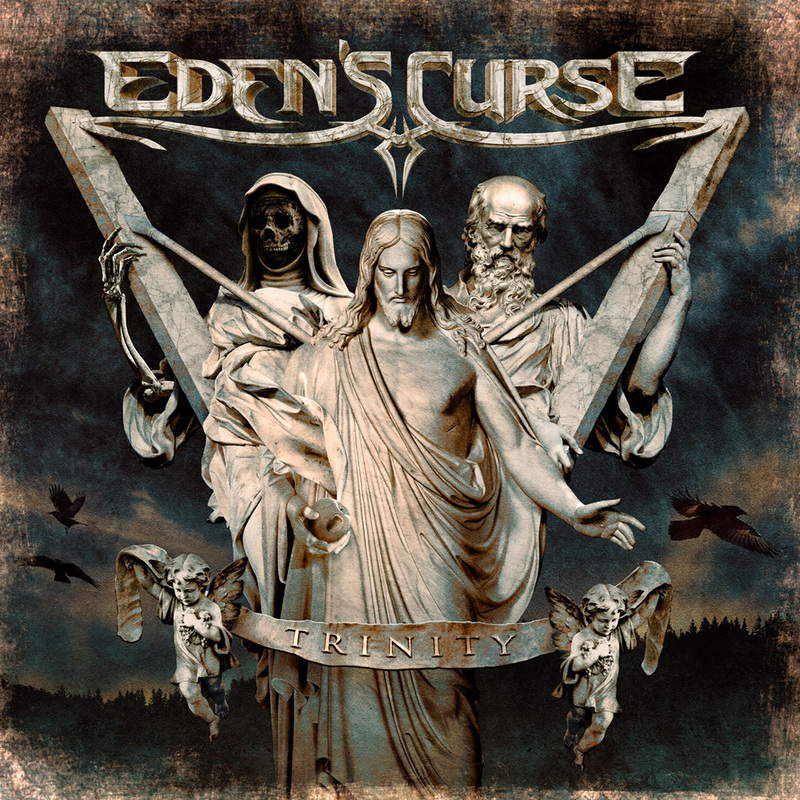 Packed with all their traditional trademarks, “Trinity” is arguably the most powerful sounding EDEN`S CURSE record to date. From Thorsten Koehne’s wall of razor sharp guitars, to Messrs Logue and Newdeck’s pounding rhythm section, Dennis Ward’s sublime production has allowed these songs to explode from the speakers in a sonic assault wrapped around the instantly recognisable sound of Michael Eden’s powerful yet crystalline vocals. “Trinity” also marks the bands recorded debut with new keyboard player Alessandro Del Vecchio (Glenn Hughes / Ian Paice / Edge Of Forever / Moonstone Project) whose contemporary approach to the keyboards harks at hints of Kamelot thanks to the huge orchestral passages throughout, yet never detracts from the signature EDEN`S CURSE sound. As has become accustomed with each EDEN`S CURSE release the band have once again recruited some outstanding guest vocalists to collaborate alongside, and this time they have truly outdone themselves. Duetting with Eden on the epic Melodic Metal anthem “No Holy Man” is none other than Dream Theater vocalist James LaBrie, who also contributes backing vocals on the whole album. Elsewhere Andi Deris of Helloween duets on the bruising “Black Widow” which is the band´s heaviest track to date, somehow managing to marry power and melody perfectly. The opening intro ‘Trinitas Sanctus’ gives the feel of a concept album. Those expecting a ‘Mindcrime’ needn’t bother. Concept it aint, but powerful melodic rock it certainly is. ‘Trinity’ sets the stall out for what is to follow, Eden’s higher registered and Marmite trademarked vocal stylings (certainly a voice that does not match his look), but gives Eden’s Curse a very distinctive sound. ‘Saints of Tomorrow’ is akin to a Firewind groove, great playing, cool harmonies, and good chorus. Pulling James LaBrie for ‘No Holy Man’ is a bit of a coup. Some may remember him for his melodic pre DT role in Winters Rose, and proves again he can sing comfortable in a range of styles – even the video has a NADS feel to it. ‘Can’t Fool The Devil’ is one of the faster tracks on offer, edging more towards metal than their usual melodic-ness. Andi Deris’ duet on ‘Black Widow’ proves to be one of the fastest and heaviest songs, and works well with both vocalists. “Trinity” is a classy affair that sees EDEN`S CURSE once again take steps forward and cements their place alongside many of their contemporaries in today´s European Melodic Metal scene. After two successful and extremely well received albums, now “Trinity” shows EDEN`S CURSE even more improved and powerful than ever before.